Defining characteristics of a psoriasis plaque consist of a mostly circular, raised red patch of skin that is itchy, inflamed and painful. The top of these plaques are silvery-white and scaly looking, due to an excessive amount of dead skin cells amassing rapidly to create these thick lesions. Depending on the severity of the psoriasis outbreak, plaques will remain separated from each other on the body or enlarge to attach to other plaques. Cracking and bleeding may occur if psoriasis affects body areas that are frequently engaged in flexing movements, such as the knees, elbows and hands. What Causes a Psoriasis Plaque to Develop? Plaques can occur as "flare-ups" or "outbreaks" at any time in the life of a psoriasis sufferer. Factors ranging from infections to weather changes to experiencing a stressful situation may provoke a psoriasis attack that results in one or two plaques or dozens of lesions covering the body. Researchers think that patients experiencing psoriasis outbreaks following a stressful event may possess a specific gene making them predisposed to encountering emotionally-caused psoriasis flare-ups. This inherited propensity of psoriasis may also skip generations. For example, a grandmother and her granddaughter may both suffer from psoriasis but the child's mother or father does not. Further, someone may carry the psoriasis gene but never experience psoriasis unless a certain trigger activates the gene and forces the immune system to react abnormally to the body. Researchers working with synthetic and biologic form of medications created new treatments for relief of psoriasis plaque symptoms. 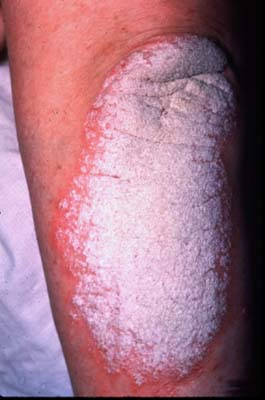 In 2009, the FDA approved a calcitriol ointment called Vectical for mild to moderate psoriasis in adults. Vectical is a vitamin D3 cream containing calcitriol, a component of vitamin D3 that has been shown to be successful in clinical trials involving psoriasis patients. Following testing of the drugs in accordance with the Federal regulations, the FDA (US)approved Vectical ointment. Trials revealed that Vectical improved psoriasis plaque symptoms after two weeks of use, with relief sustained for another eight weeks following application of the ointment. Adverse effects of Vectical use were minor and consisted of hypercalciuria, a urine abnormality due to elevated calcium and excessive skin dryness. When dealing with mild to moderate psoriasis, patients often choose natural forms of treatment rather than experience the sometimes uncomfortable side effects of synthetic medications. Some turn to herbal medicines to relieve the itching and swelling of psoriasis. Oregon grape ointments are often effective in easing discomfort of psoriasis due to containing oxycathine, berberine and berbamine, ingredients providing anti-inflammatory as well as antioxidant properties. Milk thistle is another herb that may actually inhibit the T-cell activity predominately responsible for the overproduction of skin cells during a psoriasis flare-up. Creating a paste of oregano, aloe vera and cayenne herbs may also be helpful in reducing pain and itching as well. Herbal treatments do not usually work on severe cases of psoriasis but since patients respond differently to the many types of psoriasis treatments, some plant-based ointments or teas may help improve psoriasis plaque symptoms. Patients can also try combining herbal remedies with sunlight or phototherapy, if they wish to avoid prescription medications or the possible severe side effects of biologics.